Following on from my Alanna picture, it's Veralidaine Sarrasri (Daine) from the next series Tamora Pierce wrote, The Immortals. The series, and the character were always my favourite of Pierce's Tortall stories - possibly simply because I read them first and it is via them I formed my first impression of the world. But Daine does have an awful lot of undeniably awesome moments. Pierce also steers skilfully clear of Mary-Sue-dom despite having a friend-to-all-living-creatures, unknowingly-attractive, awesomely powerful god-child as her protagonist. Daine is endearingly down-to-earth, and often cross and grumpy. This is also the series where Pierce's attention to authentic detail really kicks in. Daine's interactions with animals feel real because Pierce has so thoroughly researched the biology, habits and personalities of the animals she writes about. Apparently Daine first came to Pierce when she was watching a David Attenborough documentary, and the influence of that serious and sharp-eyed attitude to natural history is apparent throughout the series. What you see so far is a line drawing of brown paper, the skin and hair with an initial layer of acrylic colour. 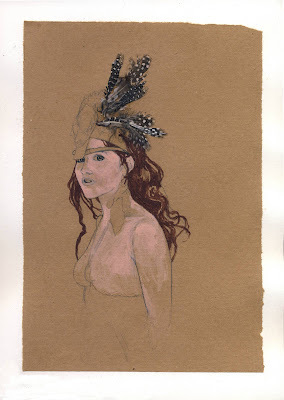 The feathers on her (headdress? Actual head, semi-transformed?) are real feathers. As is evident from previous work, I love working onto brown paper in any case, but somehow brown does seem to be the essential colour I always associate with The Immortals. Perhaps because Daine's magic manifests as copper, perhaps because I associate the colour brown with nature and animals, perhaps simply because the first of the gorgeous covers for the series by David 'awesome' Wyatt is rather brown. I want to surround her with animals and animal motifs, naturally - maybe some painted but largely found images. Which is difficult as I have not yet found many of the right sort, and at the right size.